Osho writes, "Every religion, upto now, has divided life into two parts, and while they accept one part they deny the other. Krishna alone accepts the whole of life. Krishna alone accepts the body in its totality. And he accepts it not in any selected dimension but in all its dimensions." When one read the life of Prophet Muhammad, upon him be peace, one can see the same truth. 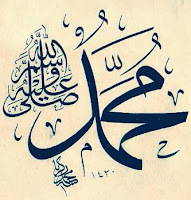 All dimension of life come into full manifestation in the life of Muhammad. What role he didn't had to take up? He didn't depend on others for his life, didn't sit there in a cave, temple or jungle hoping that his companions will feed him. He was a faithful merchant and earning person in his earlier days. He was a complete family man tending to the mundane needs of his family. He would help her wives cook, would mend his own shoe or clothes without asking other to do it. He was unlike any other prophet or spiritual guru who would live out of the troubles of everyday life and talk high things all day. Rather, he was the best example how a man can bring it full circle; performing all the needs of this world and at the same time to be immersed in divine consciousness. He was a social reformer and social worker, he lead the nation, he founded new community, he was warrior against oppression, war planner, spiritual guide, caring friend, loving father - what not. Again coming back to the writings of Osho, "Krishna is against repression. He alone does not choose he accepts life unconditionally. He does not shun love; being a man he does not run away from women. As one who has known and experienced God, he alone does not turn his face from war. He is full of love and compassion, and yet he has the courage to accepts and fight a war. His heart is utterly non-violent, yet he plunges into the fire and fury of violence when it becomes unavoidable. He accepts the nectar, and yet he is not afraid of the poison." See the life of Muhammad. All the war in the history of islam that the Prophet had to fought, was fought only to protect the vulnerable. Only to uphold the justice and whenever possible he made peace treaty and avoided any blood-shed. We must not forget that it was a dark-tribal-society where fight among groups/tribes was almost a daily affair. Amidst all this, his faithful character and compassion to all was without question. More than the figure of Krisha, Prophet Muhammad excels in the combination of the compassion and justice in so many role he had to perform. So this is the character of Muhammad and unlike any other Biblical Prophet he is just there in prefectly recorded history; no bias, no fabrication. His life is written down by his companions, by other individuals and which are well preserved till today. When even the historical fact of the existence of many Prophets are in question, the life of Muhammad with all its human values are well preserved. Let me finish with what Osho wrote and what i feel speak a very important dimension of reality which is so subtle, often we fail to realize it. "There is no such point in the cosmos where nature ends and God begins. It is nature itself that, through a subtle process of dissolution, turns into God, and it is God Himself Who, through a subtle process of manifestation, turns into nature. Nature is manifest God, and God is unmanifest nature. And that is what adwait means, what the principle of One without the other means. We can understand Krishna only if we clearly understand this concept of adwait, that only One is – One without the other." So it is with Muhammad, the concept of Khalifatullah, 'the representative of God', the manifestation of Divinity in its totality, coming full-circle, for which he is called Insan-e-Kamil, the Perfect Man.